One of those main drags, formally all-industrial strips at the edge of the Slope and sliding into Gowanus, is like crossing a litter strewn highway—cars racing like bats out of hell. I want nothing more than to bustle down an insular side street, mish-moshed with brick and brownstone homes. The new vision for these avenues was dreamt to be the tony Manhattan Fifth Ave. of Brooklyn, lined with high-rise condo buildings. No, no, no! Keep Brooklyn strong on its own Borough strengths. Enough of the Manhattan-ization of all New York City. New Yorkers need diversity. They need a promise of utopian heterogeneity, they need Emily Weiskopf and her latest work set to reveal at 11am on Monday, October 28th 2013 at the traffic median on 4th Avenue between 3rd and 4th, in Brooklyn. The piece is called “Unparallel Way.” The sculpture will be on display for 11 months as a part of Brooklyn Utopias art project, which nourishes differing visions of an “ideal” city. Made of aluminum, and 140 feet in length with varying heights at 12″ width—the double yellow do not pass lines, ripple from the pavement. Weiskopf’s work is making waves on 4th Avenue and throughout Brooklyn. 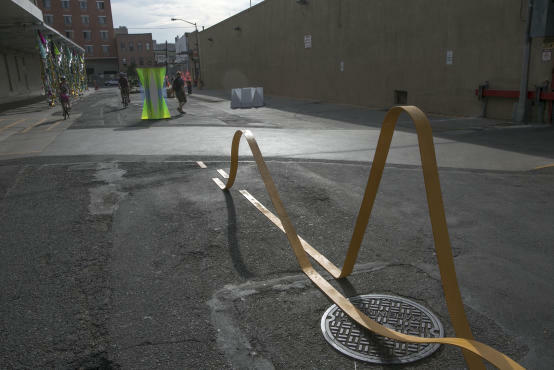 The piece was also shown on Rock Street, Brooklyn, NY in June 2013 for the Rock Street Sculpture Show curated by Deborah Brown and Leslie Heller. Brooklyn Utopia curator Katherine Gressel and other judges selected artist Emily Weiskopf’s piece for its can’t miss, ever-present qualities. Brooklyn Utopias: In TRANSITion, is in partnership with the Old Stone House and the NYC Department of Transportations’s Urban Art Program (DOT). The veins of New Yorkers, new and old, are infused with diversity. New York has always been an epicenter of the classic and the new. (Re)developments are our infusions. We who call it home crave that urban creativity. Exemplary public art work is an essential admixture, and so must be chosen with utmost care. Emily Weiskopf was born in New York and currently lives and works in Brooklyn, NY. She received her BFA from the Hartford Art School and her MFA from Tyler School of Art. Her work explores the notion of life as cycle by referencing tracks, roads, and gates as a symbols and metaphors which build our landscapes.